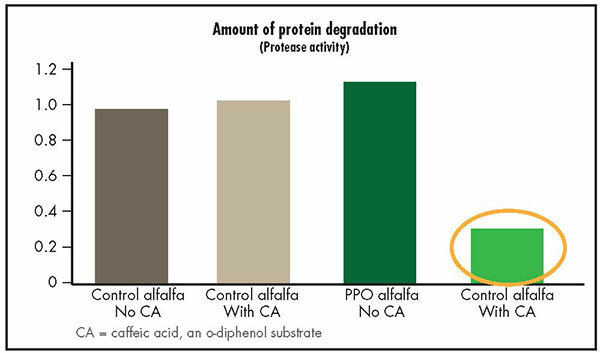 This chart shows the reduction in protein degradation at 24 hours when a PPO alfalfa is ensiled with its substrate, o-diphenols, in the form of caffeic acid (CA). The presence of PPO alone or CA alone did not reduce protein degradation. Alfalfa is the most widely used perennial forage in the U.S. due to its high digestibility, its ability to fix nitrogen, and its high protein content. But much of that protein is degraded during ensiling and in the cow’s rumen — as much as 80 percent is under poor ensiling conditions. Protein degraded during ensiling is poorly utilized by the cow, and much of the nitrogen in that protein is excreted in manure and lost to the environment. If researchers could redesign alfalfa to improve its protein utilization, the economic and environmental payback would be substantial. How substantial? Different estimates show that a redesigned alfalfa with a 25 to 40 percent decrease in protein degradation during ensiling and ruminal digestion would save an estimated $100 to $300 million per year for the U.S. dairy industry by reducing the amount of protein supplements purchased. In addition, with more protein utilized by the cow, there would be substantial reductions in manure nitrogen excretions and subsequent nitrogen losses as ammonia, nitrous oxide (the most potent agricultural greenhouse gas) and nitrate. Scientists at the U.S. Dairy Forage Research Center (USDA Agricultural Research Service) are working on two long-term projects to potentially develop an alfalfa with improved protein utilization. One approach uses condensed tannins, the other uses an enzyme and its substrate. It’s interesting to note that both approaches are based on compounds found in other legumes but not in the alfalfa plant. When a forage is harvested, the plant releases proteases, a broad term for enzymes that break down protein into nonprotein nitrogen products. With silage, these proteases keep breaking down plant protein until the silage pH drops below 5. This is one reason ensiling practices emphasize the need to rapidly decrease silage pH. Losses of “true protein” in alfalfa during ensiling can reach as high as 80 percent. Although a portion of this nonprotein nitrogen can be converted to nutritionally valuable microbial protein in the rumen, excessive levels are converted to urea and excreted in urine. In the rumen, reducing protein degradation means that more feed protein “escapes” the rumen and moves into the hindgut where it can be digested, absorbed, and used to make milk and keep the cow healthy. When studying protein degradation among various legume forages several years ago, USDFRC researchers noticed that red clover, even under poor ensiling conditions, typically has minimal degradation, maintaining 70 to 80 percent of its protein intact. Further research discovered that red clover has an enzyme, polyphenol oxidase (PPO), along with its substrates — special chemicals called o-diphenols. When PPO acts on the o-diphenols, o-quinones are produced. The highly reactive o-quinones bind with protein and prevent the proteases from degrading protein. But red clover lacks many other qualities compared to alfalfa. So the next research question became, “Can the PPO system that works so well in red clover be transferred to alfalfa?” First, the scientists conducted an extensive survey of alfalfa germplasm and found no natural variants that contained active PPO in the vegetative portions of the plant. Therefore, a precision breeding approach was used to insert the red clover PPO gene into alfalfa. This process was quite successful, and alfalfa plants expressing the red clover gene can inhibit protein degradation when appropriate o-diphenols are added as a substrate. The next step is to find a way to supply alfalfa with o-diphenols since alfalfa currently does not produce this substrate upon which the PPO can act to produce the o-quinones. The most desirable approach would be to have alfalfa synthesize the o-diphenol substrate, and USDFRC scientists are currently working on ways to introduce the necessary genes into alfalfa. An alternative approach would be to add external sources of o-diphenols (abundant in many plants such as potato peels, coffee grounds, and forages like timothy) to alfalfa at the time of ensiling. And a third approach is to co-ensile the PPO-modified alfalfa with other plant materials or extracts that contain o-diphenols. A redesigned alfalfa with protein protecting characteristics would improve farm profits and nitrogen use efficiency, and it would reduce the amount of nitrogen lost to the environment. Tannins, as a general definition, are a subclass of compounds (called polyphenols) that are produced by plants and are distinguished from other polyphenols by their ability to bind to proteins. Condensed tannins have been found to reduce protein degradation in forages. The exact mechanism is not known, but it is thought to be accomplished when tannins form complexes with forage protein during the ensiling process and during rumen digestion, thereby preventing the proteases present from doing their job of breaking down protein. Condensed tannins are produced naturally in forages such as birdsfoot trefoil; but, in alfalfa, it is only found in the seed. USDFRC scientists are now assisting scientists from Forage Genetics International in analyzing alfalfa plants whose genetics have been altered to produce condensed tannins in edible portions of the alfalfa plant. This research is in its preliminary stages of development. It will be several years before alfalfa redesigned to reduce protein degradation reaches the market. But researchers believe the economic and environmental paybacks make it worth the effort. In small-scale ensiling experiments, the PPO-alfalfa on the right turned brown and had reduced protein degradation because an o-diphenol substrate was added. The silage on the left was not treated with the o-diphenol. This article appeared in the February 2016 issue of Hay & Forage Grower on pages 6 and 7.